The pattern shows you how to build your wire armature so all the proportions are right from the start. Then you add crumpled foil to fill out the rounded forms – the pattern helps with that, too. 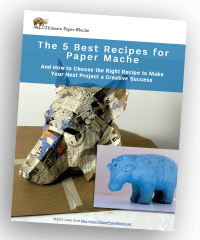 After your sculpture gets a thin layer of paper strips and paste, you’ll finish it with acrylic paint and varnish. Thank you for sharing and teaching , I made the bunny from your video, made some mistakes but eventually was able to finish it, even add some fur to the tail and head, ! Gave it to one of my grands, she love it! Really looking forward to try the chihuahua , for they are one of my favorite dogs!! God bless you! Hi Luz. Do you have a photo of the bunny you made? We’d love to see it. Hi Liz. For the tiny dogs, I used 11.5 gauge armature wire, although that’s an odd size and I can’t remember where I bought it. 10 gauge is a little heavier, but it’s easier to find and it work work just fine. If you want to make a larger sculpture, you would need heavier wire. It’s a trade-off between a wire that’s stiff enough to provide the needed support for the armature, and a wire that can be bent easily. Could a life size, rideable (for an adult) rocking horse be made with paper mache? I would love to make one, because the one I want comes from Holland, and it’s $8,000! Hi Sharon. I can’t see why a life size rocking horse couldn’t be made with a paper mache skin, but it would need a strong structure underneath to withstand the stresses of the rocking and rider. That would probably mean using a wood structure, and I wouldn’t know how to design one. Perhaps you could find instructions for a child-size rocking horse and scale it up. Thank you and I love your work! 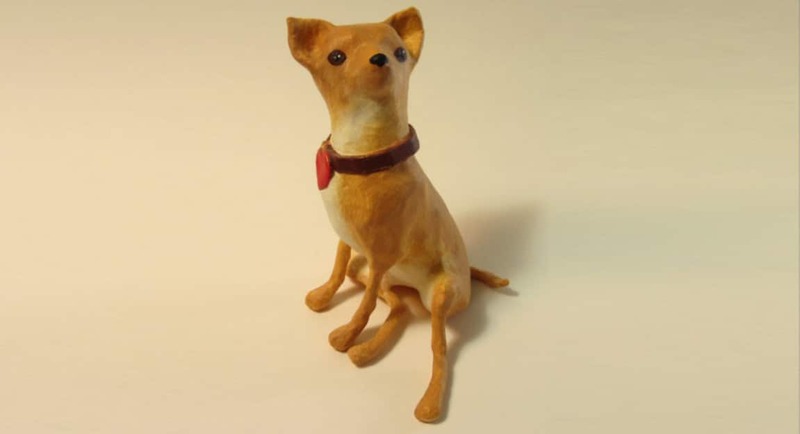 Hi, I am making a dog that I would like to be in the same slouch/sitting position as your chihuahua. I noticed that you said you cut four pieces of wire, one for each leg. I was wondering what the advantages are of cutting and attaching each leg separately rather than cutting two longer pieces of wire and taking a wrap in the center, attaching to the backbone wire, thus creating two legs at once. Is it harder to get the spacing between the legs using that method? Also, do you take a wrap of each leg wire around the backbone wire? Thanks. Hi Cat. For all the dogs in my tiny dogs book I did exactly as you suggested – I cut two long pieces for the legs, and each piece was used for one front leg and one back leg. The middle follows the backbone. I don’t think I made a video showing the armatures of the dogs in the book, but if you sign in to your Amazon account and look inside my book, you can see how it’s done on page 10 and 11. I use masking tape to hold the backbone and the middle section of the leg pieces together. Thank you so much for your thoughtful and prompt reply. 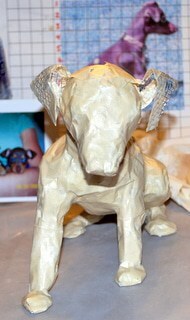 I am working on my first project, trying to make a model of my sister’s dog for her Christmas gift. If it turns out, I will show you! I have been somewhat intimidated by the armature making process. But you have helped a lot! Thanks again. I can’t wait to see it! Let me know if you have any more questions. Well, here I am again. I am having trouble shaping my dog’s head (cut out of cereal box cardboard). It seems I did fine building up shape and “muscle” on bare wire for the legs, tail and body, but when it comes to the flat cardboard head, all my attempts make the head much too large. I guess I should make the cardboard head smaller so the added-on foil and masking tape doesn’t create a huge head. Do you have any other tutorials that show the process? Hi Cat. For the armature, I have quite a few tutorials. The Panda was one of my first ones. He doesn’t have a wire armature, but the idea of not allowing the foil to go above the silhouette still applies. That’s really the trick to it. Add foil to the side, but not above the outline. There are also more detailed instructions in my book, of course. 😉 The chihuahua was the inspiration for that book, in fact. He was so much fun to make. Jonni, Your video gave me the courage to get on doing the dogs. So far I have Tikki started. I will attach a photo. I’m ready to begin with the paper mache and am excited for the lesson on making fur. Any comments so far? LOL! I am embarrassed to say that I haven’t finished “the begging dog” from your book. I have covered it with paper mache a couple of times, but I don’t like the “fur” I did, so it is still unpainted. Thank you! Thank you! I am so very glad to have found you and ecstatic to share your knowledge. You are are a blessing! Jonni, this is really wonderful to see. Now I don’t know whether or not to start over with the two small dogs I have started! They will go with Loki, my dog. (This is beginning to sound like a broken record!) I have already cut out the patterns, so I’ll probably proceed. I put paper mache on Pegasus’s wings tonight. Hopefully the clay and wire I added will be strong enough to hold them up. The wings are 2′ long, and the poor horse is 18″ tall. I love this process and she is really cute already. Can’t wait for Part 2. I’ll have to give it a try. 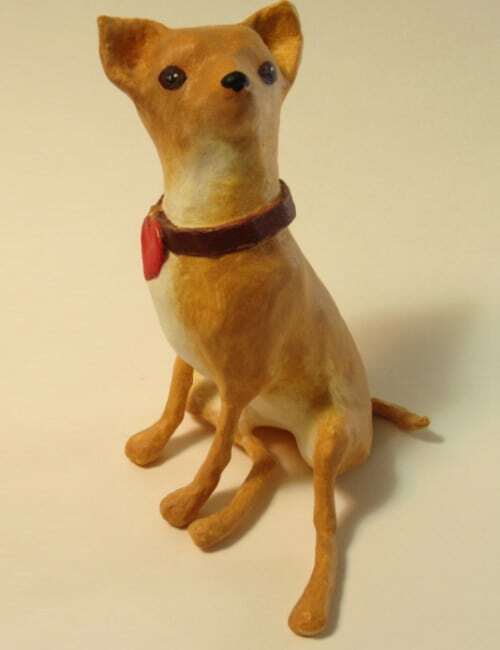 Hi Jonni, he/she looks great, I did a Chihuahua, that worked out really well, unfortunately, I did my usual and did not get a good pic of it, before someone bought it. 🙂 I used the cardboard cutout for the body, but just tightly scrunched foil for the legs, that gave the support, plus the movement need to get the legs right. I really wish I had got a good pic, as it was one of the few dogs I did that I was happy with the paint job I did. I wish you’d taken a photo, too. I’d love to see how it came out. Cartuna.net. Paper mâché artist Steven Wirtz. Saw these at an art fair. he uses paper mâché on wire armatures, with funky paint. Most are about 12 – 18 inches high. This guy’s animals are lighter and more whimsical in nature than Jonnies. I can’t decide which one I like the most. Maybe the cat…? Jonni, I love your chihuahua especially because it is small and feels more doable for a beginner like me. Thank you for sharing all your methods and recipes.